Are you a local homeowner looking for assistance with your house cleaning? At Handy Cleaners, we know that everyone needs someone to pick up the slack from time to time as this kind of work can be more than demanding! We provide cleaners at affordable rates that do nothing to affect the quality of their undertakings. Putting the customers first at all times, we are the best cleaning agency in South West London. If you come to us you’re sure to be satisfied with fast and reliable workmanship we constantly provide. We’re a cleaning company who won’t leave you behind. We’ll bring you along and involve you every step in the way, so for personalised answers that really work call 020 3743 0505 today! How Do We Help Our Clients With All Their Cleaning Needs? When it comes to home cleaning in South West London, there’s literally nothing that we don’t do to the highest expert level. That’s why we’re the most popular local choice, and we’d love to show you exactly what we can do to help you. Do you need upholstery cleaning? We can be there in no time to have your things in better condition than you’d ever imagine! Even carpet and rug cleaning is handled with complete safety, so you get a real comfort no matter what we do. We always follow through with eco-friendly cleaning with everything we do. 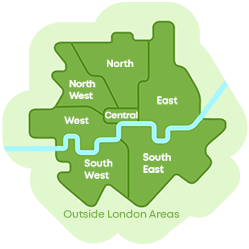 That’s how our cleaners in South West London have been able to present cleaning services with a conscience to all customers in the surrounding area! What Sets Our Cleaners in South West London Apart? It’s obviously important for a company such as ours to have the highest quality cleaners around, and that’s something you get as an absolute guarantee when coming to us. Nowhere else will you find house cleaning experts so sure of their abilities and willing to help customers on a personal basis. We’ll make sure that all of your wishes are seen to without any delay or hurdles, and it’s that kind of reliability that makes us the best cleaning services in South West London. Our offers are outstanding and are certain to beat any competition, and we’ve spent a lot of time making sure that our professionals are at the absolute top of their game. Call up 020 3743 0505 today to find out more! Primarily made up of the important boroughs of Kingston upon Thames, Lambeth, Richmond upon Thames, Sutton and many more, South West London is a true melting pot packed with attractions, landmarks and impressive things to see. You can find such places of cultural importance within as Hampton Court Palace – an amazing historical building that dates right back to before the fourteenth century! Other famous buildings include such churches as Trinity United Reformed and Methodist Church, along with many other places of worship that have stood the test of time. The Seacombe Theatre is also an important part of local culture that is both treasured by locals and heavily enjoyed by visitors! Our cleaning firm in South West London will See to It That You Save Money! One of the things we’ve always thought it’s important to uphold as a cleaning company is affordable and cost-effective hires. We don’t believe it’s any good charging above the odds for work anybody can do, so we opt instead to show you what real qualified cleaning experts are capable of. Handy Cleaners makes home cleaning simple, easy and cheaper than you ever would have thought. You can really feel the benefit of our help at budget prices, and you’ll quickly be on board with the assistance our cleaners provide. Don’t waste another moment in booking your reservation. Pick up the phone and speak to us by dialling 020 3743 0505! Get the best domestic cleaning service at the lowest price!